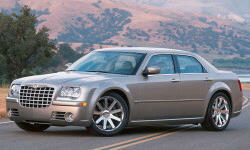 Chrysler 300 Pros and Cons | Page 1 of 2 | Why Not This Car? What drives people to buy (or not buy) a certain car? 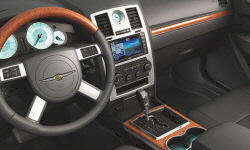 TrueDelta's members share Chrysler 300 pros and cons based on their real-world driving experiences. AWD in a 300 is the first option to check. Peroid. My opinion on a possible lemon. 2012 Chrysler SRT8: RIDICULOUS. COSTLY. AWESOME! Nothing looks like a 300. Very distinctive styling that evokes a love or hate reaction. I happen to love it. The 3.6 Pentastar engine in this car is probably the most surprising performance engine I have driven considering the weight and size of the 300. Looking for a 300 and unsure what engine to get? The 3.6 choice will not be regretted. Looks good up close and from a distance, at all angles. Nice paint job. Bold, agressive styling that says" American Made" with a few subtle "euro touches" as well. My color choice...Cool Vanilla...is, in my opinion, tops the collective color pallette of any/all availeble vehicles - foreign or domestic. The 340 H.P. Hemi is a dream engine. Lots of power on hand when needed and very civilized when just cruising. The transmission is very smooth and very responsive. I love listening to this engine!! Mine has the upgraded Boston Acoustic 6 speaker system and it sounds great. When looking for a 300 I knew I wanted one with the 6 speaker system. We still love the smoother sleeker style of the older 300Ms vs the newer boxier 300s. Note Chrylser is redesigning the new model 2010 300 exteriors (and 200s) to be sleeker & aero styled more like these old 300ms! Unique. Stands out from other cars that all look similar.